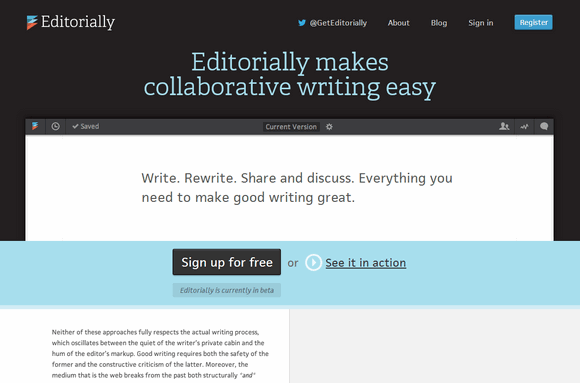 Editorially is a new collaborative writing and editing platform. Their goal is to support and encourage that writing process — from the first flash of inspiration all the way through to publication, and at every point in between. Editorially achieves this goal in many ways: a Markdown-based writing environment lets you focus on the words and create clean markup easily; collaboration tools let you invite friends and trusted colleagues to review or edit your work; a document version system lets you mark points in a document’s history and compare versions to see what changed; notes and activity feeds encourage you to reflect on your work, for yourself and for others; and discussion threads recognize that the conversation around a text is just as important as the text itself.